How To Overcome The 3 Anxious Moments While Praying For Your Husband. I like to hear good report of your success in praying your husband out of cheating and immorality, to be faithfully committed to your marriage...according to the will of God. That's why our prayers are Holy Spirit inspired and direct, without fluff, entertainment or drama. And I want to say God has backed us up with awesome answers all the way. But I don't want you to feel lonely while we are at the prayers; it does no good if you lose steam or wobble on the journey. I'm here to guide, encourage, help and pray your individual prayers with you. When all is said and done, it is your faithful loving husband and marriage happiness that counts. Targeted prayers always work, though the duration may differ according to individual circumstances. Sometimes during the course of these prayers, you encounter what seems like delay or stagnation...and you wonder. Yes, you query the worth and effect of prayers in the recovery of cheating husbands. This is fairly common and legitimate. That's why I'm discussing the various sides of that anxious stage of your march towards taking back your husband from filth and the strange woman. Your enemy is not such a hard nut to crack when you have a good understanding of the spirit of prayers. By ‘enemy’ I mean anybody (spirit or human) or any occurrence and experience that is against the will of God for you. The will of God for you is written in the Bible. If you have difficulty finding the will of God for your family and marriage, contact me and I will show you. At one point or the other, many of us have passed through one (or more) of these stages. We needed encouragement and help (oh! we all need help!) to get our desire fulfilled. That’s what this ministry stands to provide for you by the grace of God. 1. I’m not so sure again that prayers can change my cheating husband. I can't take this anymore! 2. This is not what I expected. Can someone tell me what's going on? 3. I took my husband back by prayers…but he's returned to the strange woman. Why? I'm Not So Sure That Prayers Can Change My Cheating Husband. I can't Take This Anymore! At start of prayer sessions, I always ask if you believe in the power of prayers to turn your cheating husband around. The essence of that question is to gauge your faith level and possibly do ‘repair’ job! Usually the answer is a resounding yes! But within a few days of prayer, some people wonder if it’s ever going to work. That’s not altogether strange or uncommon because many greats in the faith (biblical and contemporary) also asked similar questions. I understand why this is so. You have endured your husband’s betrayal, back-stabbing, cheating and lies for so long before God connected you here, you are now desperate for a quick fix. By hearing the good reports from the prayers, and being full of faith, you develop ideas of what prayer should do...and by when. This is a wonderful mindset which shouldn't fizzle out. This Is Not What I Expected! Can Someone Tell Me What's Going On? The second group are those who, while at the prayers, see their cheating husbands getting deeper into immorality, even contemplating divorce. Listen, if your prayers hit the enemy hard, he is going to fight back. But you can raise the heat by more of such power prayers! As for me, when I sense a shift in the situation, I let all Heaven loose on the camp of the enemy by praying more with passion…in the spirit. I tell you, if you are able to do that (and you can), the tide would change very fast. In the same manner, if the change you see is on the right direction (the expected), you’ll still need to increase your prayers to quickly vanquish wickedness and have your husband faithfully back in your marriage. When I pray, and the object of my prayer, makes a move (fight or flight), it excites me. Either way, it means your prayers count and God has raised trouble in the camp of the enemy. But if you pray for change of your cheating husband and things remain absolutely calm without shaking, review the prayers fast. I Got My Husband Back By Prayers...But He's Returned To The Strange Woman. Why? By far the most frustrating experience that emerge from time to time is when you pray and gain expected victory over your cheating husband, and lose him again to another affair. Number one: Lack of Divine Wisdom. Lack of the Application of Divine Wisdom. Ultimately, prayer usually hands over to wisdom. Do you watch athletes in a relay race? One runs his space and hands the baton over to his next teammate who continues the race. But they are all in one team. So it is with prayer and wisdom. One hands over to the other and back again until the job is done! Prayer is the wisdom of God but prayer shows you what next you should do to keep your victory. See, in Isaiah 38 when Hezekiah prayed against his death sentence (verses 3 and 4), God heard and answered (Verses 5 and 6). But God also gave instructions on the treatment for Hezekiah's recovery from his ailment (verse 21). That is wisdom! God told Joseph and Mary to take baby Jesus to Egypt to escape genocide targeted at the just arrived Savior of the world (Matthew 2:13). That is wisdom! In Luke 8:54-55, Jesus prayed the dead girl back to life. But He asked them to get her something to eat. That is wisdom! Doing what is appropriate according to the counsel of God. When you pray, God shows you what to do by revealing next steps of action to you, or to other godly people connected to you. When you do the commanded, it is wisdom. If you don’t do it, it is not wisdom (which means it’s foolishness). Wisdom completes the turnaround of your husband. Prayer cannot substitute for the divine wisdom of God. Prayer Decline. 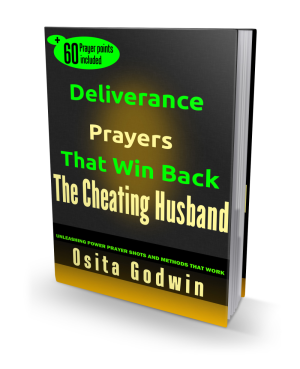 It is so common to slow down prayers when your cheating husband seem changed. But he may not have taken firm roots and may need divine wisdom to be strong. You need prayers to get prevailing and consistent wisdom. When wisdom is lacking, you can lose your husband again to sexual immorality and evil influences. Now, Jump Over That Prayer Hurdle! Many good reports quickly pop out of those three anxious moments in the prayer journey. This comes by understanding, which you now have! I'm here, also, to help you review matters as they arise, and launch intense prayer battle for the return of your cheating husband. Some others didn’t know what to do and didn’t get in touch, so they suffered so much for so long. Now, you know what to do. Can I Reach Osita By Phone For Instant Response? I have received requests for telephone counseling. I would love to hear you and guide you but with thousands of wives calling, and in different time zones, I would never have the time to attend to the many of you, and still study, meditate and pray for you. Meet Us On FaceBook And Like Our Page. We do share some deep thoughts on how to pray for your husband and marriage on Facebook. I invite you to like Praying For My Husband so that your marital destiny will be roundly established. Considere Supporting This Prayer Mandate Through The Donation Window. We need and welcome financial support from anyone who believes in what we are doing in this ministry. Surely, the prayers and the counsel are blessing to so many people beyond what money can get. I need you to support this divine Prayer Project by sending us your financial seed. Please do this if you are led by the Spirit, otherwise there is no obligation. If you are led to reach out to us, you could use the Donation Window at the top right of the website. Enter the amount you wish to send, submit and use your credit card to complete it. The system sends me a daily report of those who have sent their seeds so that I can appreciate them.